What other benefits do Marissa and Margo offer me as a Veteran? We are proud participants of the Homes for Heroes program which we gladly pay out of our own pockets to make sure you have the affordable, high-quality, and dream home you deserve. What do I have to do differently as a Veteran? With us, we make it simple. Give us a call, we ask you a few simple questions, and begin your process. We communicate, on your behalf, with everyone involved, including the VA. Our goal is to make it simple, stress-free, and affordable for you. You served our country, let Marissa and Margo serve you through this process. What documentation do you need and how do you request it? What other stipulations are on a VA loan? • $417,000. There is no minimum loan amount. How long does it take to close on a VA Mortgage? 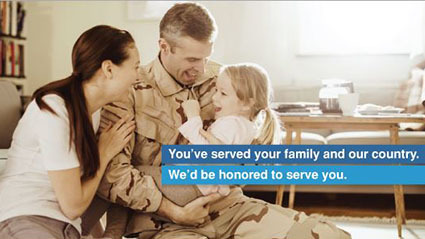 • A VA Home loan can typically be closed within 4-6 weeks (no longer than a conventional loan). • You can roll in energy-saving updates that will help reduce the cost of energy, like a new furnace, new water heater, new windows, insulation, etc. • Assumable — VA Guaranteed Home Loans are assumable by another veteran when you sell your home; however, you will not be able to re-use your VA Home Guarantee Loan benefit until the subsequent loan holder either sells or refinances. • Can I escrow my property taxes and insurance into my payments? Yes — in fact, it is required. • Is there a pre-payment penalty? No. • Can I refinance my current home with a VA Loan? Yes. • If I have sold a home previously that had VA financing, can I buy again and finance it with the VA Guaranteed Home Loan? Yes, there is no limit to the number of times you can use this benefit.